Stacking concrete blocks. 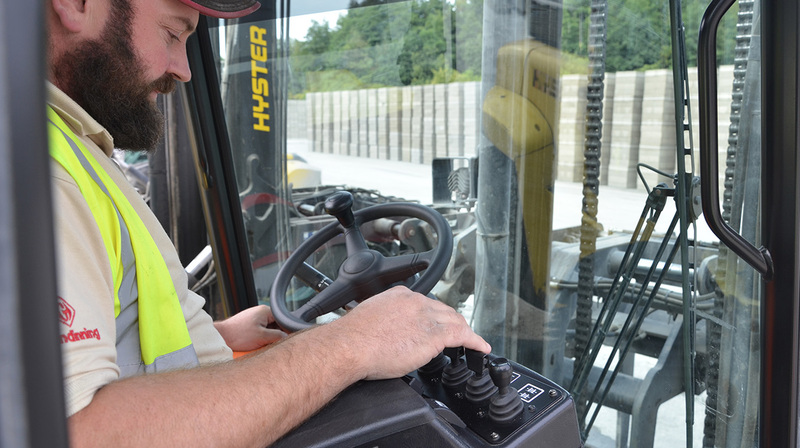 A Hyster driver’s perspective. 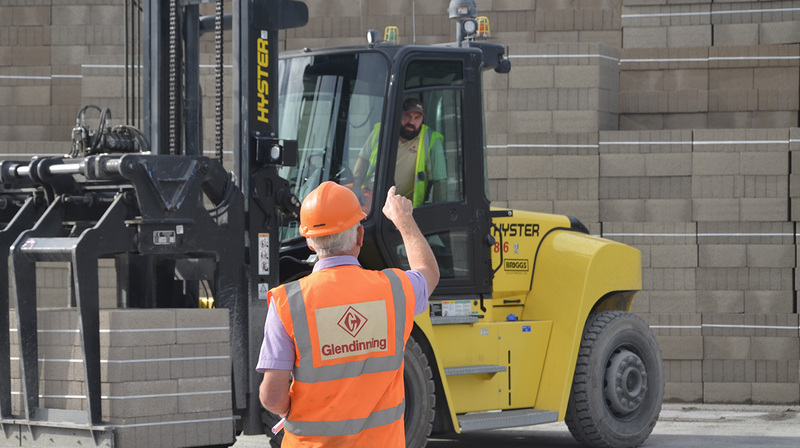 Glendinning is the largest independent supplier of quarry and concrete products both to the trade and direct to the end user in Devon and Cornwall in the South West of England. 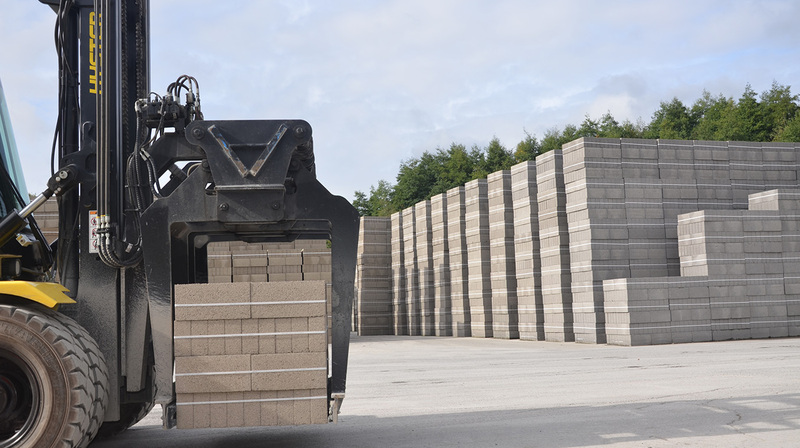 The company’s main hub in Ashburton, Devon, includes its primary quarry operation and a concrete block production line. It recently purchased a Hyster® H8XM6 specially equipped with a double block clamp to remove blocks from the production line, transport them to the yard and stack them up to five high. 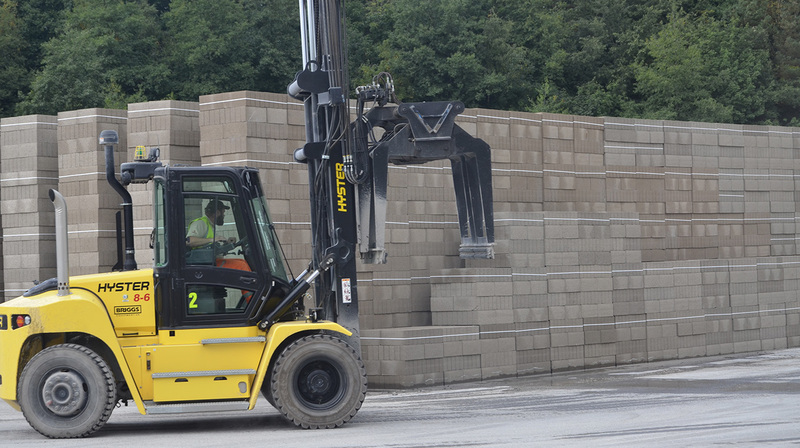 More than 100,000 concrete blocks are distributed each week from the site. In a year, Glendinning can produce and distribute up to 7.5 million building blocks to customers. The majority are shifted with just two lift truck drivers with two principal forklifts. 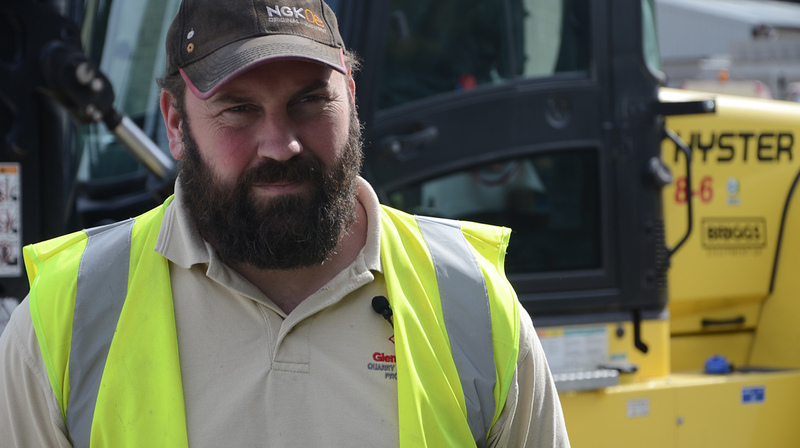 Working long shifts, which could be up to 11 hours a day, Glendinning recognised that to ensure maximum productivity in the fast-paced operation, it was essential for lift truck drivers to have an optimum lift truck operating environment. Drivers were involved in the purchase decision and trialled numerous lift trucks. 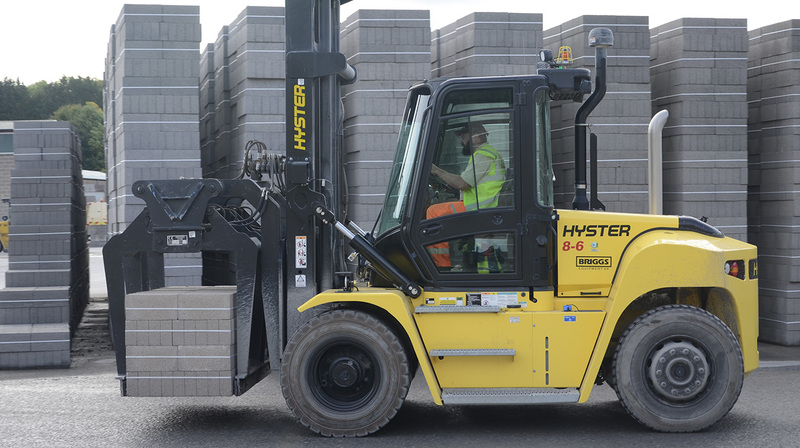 They “discounted most brands after just a few minutes”, clearly favouring Hyster® lift trucks. One important factor was the hydraulic operation. With fingertip controls for precise and effortless control of the attachment and load, this is made so easy for drivers with the Hyster® lift truck. The operators say that the H8XM6 is a pleasure to drive and that it is quiet and comfortable for an entire shift. Whatever the weather, the cab also gives drivers a protected environment that aids maximum productivity. Visibility was also a key consideration, not only of the load through the mast and over the double block attachment, but all around. To aid driver awareness in the busy yard, the fully trained drivers also have the option to glance at reverse camera screens. The screen gives additional visibility of pedestrians, moving vehicles and infrastructure and may help to minimise damage to the products, buildings and other vehicles. Drivers must keep up with production as the blocks leave the production line on a conveyor. Drivers load 20-25 vehicles each day in the busy yard. Glendinning reports that drivers can fully load lorries in less than 5 minutes, giving exceptional transport turnaround times. The company prides itself on quality service and fast, efficient response to customers in the construction industry, and Hyster® lift trucks help support this. Glendinning still has a 2003 Hyster® H8.0FT operating as a backup truck and to use during peak periods. The drivers still like using it even after 15 years. This entry was posted in 360-degree benefits, Attachments, Big Trucks, Construction Industry, Counter Balance, H8-16XM, Hyster, Hyster Europe, Intensive Applications, Manufacturing, Manufacturing Centres, Mounting Solutions, Solution, Transmission and tagged Attachments, Counter Balance, Fuel efficiency, Hyster, Hyster Europe, Innovation, Solution. Bookmark the permalink.